Material delivered to your location! 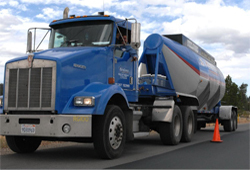 RaynGuard manufactures and ships sealcoat materials from our Sacramento location to customers all over the West Coast and to many overseas locations such as Chile, Thailand, the United Kingdom, New Zealand, Australia and many more. 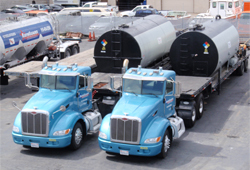 On-site self contained storage tanks! 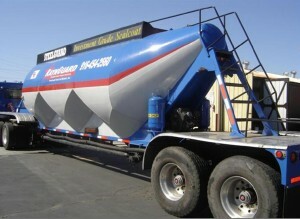 RaynGuard helps make the logistics on those larger projects easier! With thousands of gallons stored right on your job site, your work day is spent on the job, not running for material! 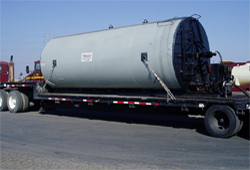 RaynGuard has a fleet of trailer mounted, self-contained storage tanks available for your large projects. Each tank has an engine powered hydraulic pack which drives a full sweep internal tank mixer and a material pump for on-loading and off-loading. Material available on-site when you need it! RaynGuard will deliver and drop off the storage unit and can deliver additional material right to it while you are working doing what you do best – seal! When you are done, we will pick up the unit and bring it home to RaynGuard. Contact us for more information at 916 454-2560.